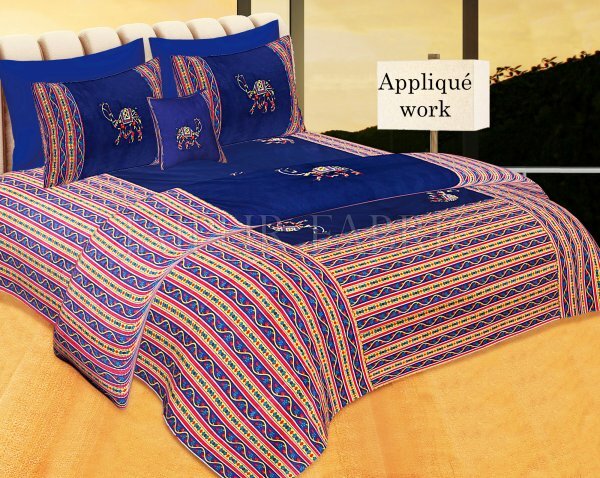 Rajasthan’s appliqué work is done along with embroidery for giving additional touch of decoration. Wall hangings, clothes, bed sheets, bags, mattress and others are a list of few items on which appliqué work is done. The basic fabric is light weighted and mostly it is white in color. Eye-catching designs, colors and different shapes are arranged coherently to give a beautiful touch of appliqué work. Applique is a traditional artwork in which one cloth is stitched on to the other and it is embroidered with metals, wood or glass pieces. By means of trade contact, Arabian or Middle East people brought this art into the India and from then onwards it is being practiced by many especially in the areas of Rajasthan and Orissa. Gota and Kinari are the two distinguished Rajasthani appliqué works. Gota is a gold colored piece or lace while Kinari is a silver colored piece or lace and is stitched on the clothes. The base cloth or fabric is usually velvet on which embroidery is done, thus giving it a distinctive look. Women costume is generally made of Gota Work. Different geometrical shapes of square, triangle of different sizes are imbibed on the cloth with dark contrasting colors makes it a perfect appliqué. Not only on costumes of men and women, but this applique work is also done on bed sheets or bedspreads with black/brown colors as the base while natural sceneries form part of the background. This is known as Barmer Applique. Traditional floor designs can also be done in the cloth using the technique of Tilonia appliqué. All these works of intrinsic values and techniques required high accuracy and talent. It is all about hand-eye-brain coordination to yield perfect beautiful results. First step is to choose the base color of the fabric on which the appliqué work will be done. It can be of dark and light colors. Then the shape of the base is determined next like circle or square or triangle or oval. Motifs are cut into leaves, birds, geometrical shapes, animals and gods. These motifs are then stitched in creative ways. Mirrors of different shapes/sizes also get affixed on it. Final step is the stitching of the borders in the appliqué. This traditional artistic work is done by people in groups, right from ancient periods. It is getting carried on from generation to generation. Intricate designs are done by experienced ones while the easier ones like border stitching are done by younger or new ones to this field. It serves as a good practice ground to perform much better and take up more difficult designs and create it well. 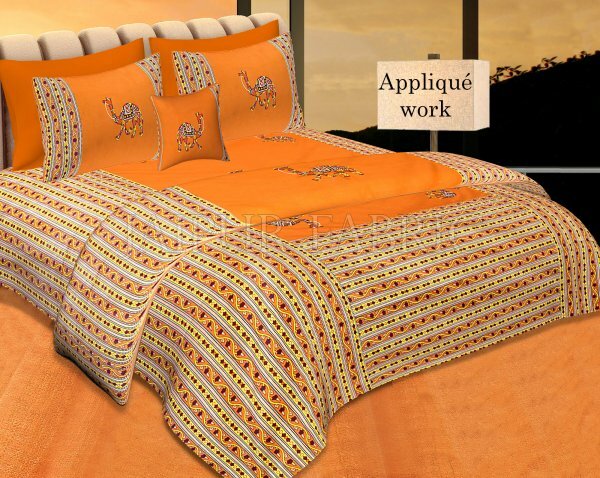 It is necessary for people to support this ethnic and traditional artistic work to go a long way by purchasing these Rajasthani appliqués and improve the livelihood of those men and women who are indulged in this field. It paves way for exotic beautiful smiles on their faces for the reward and appreciation they get for their work.